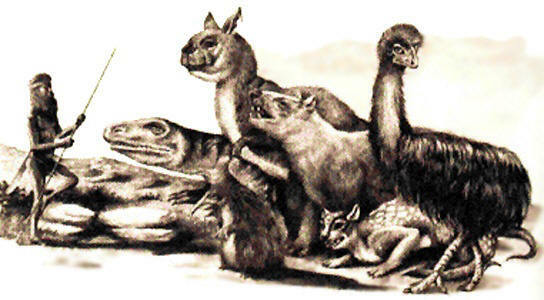 Hundreds of animal species famously died out during the last Ice Age. The reasons behind the Ice Age, Pleistocene, or Quaternary, megafaunal extinctions have been puzzled over for more than a century without any clear resolution. The problem has been called the ’Fermat’s Last Theorem of paleobiology’. These extinctions took place over thousands of years and around the world, but there was a strange specificity about which animals could stay and which had to go. There are two major theories about what caused this, the human-hunting theory and the climate-change theory. Both, yet in curious ways, are wrong. The true cause has to do with particular strengths and weaknesses of biological processes, and it unfolded over almost the entire history of life on Earth. This is a science story about a murder mystery. The title is a double entendre and this is the most important story ever told. Science is a collection of stories we like to tell each other about how the world works. This one is a detective story, with some unwitting suspects, their multiple victims, and quiet heroes. The tale has been told before, with us, the human race, as the prime murder suspect. We, the usual suspects, are framed as the Scapegoat in those legends. Other accounts retell the coming of the Sky Monsters, different kinds of beings that go by different names. "Comet" is one of those names. In a durable science story all the known pieces fit and work together. No part conflicts with any other part; no actor acts out of character. Nothing should have to be cut from whole cloth and entered into evidence without proof. This has been the problem with the account of the Ice Age deaths of the megafauna. All of these wonderful animals had sailed through the previous Ice Ages unscathed. What was different this time? If human hunters killed off this one species then why didn’t they kill off that other one, too? How could they possibly have exterminated any of them for that matter? Why did a colder climate kill animals that were better adapted for it than other animals that weren’t as well adapted, yet survived? The biggest animals should have had the best chance of surviving the cold, not the worst. If the sabertooth cat got sabertooth-cat disease, then why didn’t the lion get lion disease? If the gardener crept in through the window, why didn’t the dog bark? There were patterns to the murders in time and place as well as in the kinds of victims chosen. These patterns give us clues as to the modus operandi of the perpetrators, who were clearly very selective, very discriminating. Certain tropes recur throughout natural history, most of which I’ll have to leave out for brevity. One of course is inter-species warfare, another mass extinction. Another is a recurring theme in colonization: first the new life spreads out across the surface, there to ascend vertically into the space above. But patterns are made and patterns can be broken and this pattern was broken in the instant case. One standard of proof for murder is ’beyond a reasonable doubt’. These cases generally involve events taking place a few weeks or months in the past, with the police detective acting as an historian and a scientist of sorts. They often enough result in false convictions, just as have the megafaunal extinctions. For events taking place thousands or millions of years ago, long before we arrived on the scene with the proper forensic tools, we have to look at as many suspects as possible, no matter how innocent they might appear to be. Maybe the butler did it. We’ll have to investigate him of course, it’s de rigueur for the genre, but we mustn’t spoil the read by jumping to conclusions. Even if he had done it, he must have had accomplices for a job the size of this one. In order to positively identify the suspects, as well as the heroes, we will need to reach back a long, long way in time. As with any crime, we try to come to an understanding of the criminal’s means, their motive, and their opportunity in a given setting. We have to set the scene of the crime, look at the furniture around it, find out who the players are. For these particular suspects, their case history spans almost the entire record of life on Earth. Like a camera lens, the further we try to look back in time the fainter the picture becomes, a hazy, distant mountain. As we look closer to our time, the story comes into better focus. The camera we have to use is the record in the stone. The lower the layer sits in the stratigraphic record, the older it should be. None of the ancient dates are reliable; they all rely on untestable hypotheses—assumptions outside the purview of our science. No one can know if radioactive decay rates have been steady for billions of years past, or even if the Earth’s history stretches back many billions of years. There is plenty of evidence that the decay rates aren’t even steady today. No one has a calibrated "molecular clock" that can date genetic changes far into the past. No one was watching when the sedimentary rocks were laid down, tracking the actual rates of sedimentation, or even seeing quite how they were laid down. For present purposes these dating details are not important. For ease of reference, I’ll hew to the various published, though often in dispute, timelines as closely as possible. It is the sequence, the order of events, which matters, not the precise dating of each development. These developments follow in a logical order, the order found in the layers of rock, one more or less on top of the next, that seal the fossil remains. One thing led to the next, the next could not have happened otherwise, and some of it was written in stone, in a broken and cryptic language we have partially learned to read. Four billion peer-reviewed years ago, the stones tell us that Earth’s primordial atmosphere was made up mostly of nitrogen, carbon dioxide, and a few other gasses. There was no oxygen in the air at all, no life in the water, and the land was as desolate as the surface of Mars. Sometime after that life came in to being in the water, somehow. We do not know how or why this happened, nor have we been able to reproduce it in the lab. That mystery remains beyond the limits of our scientific knowledge, but, fortunately enough, won’t spoil this tale. Three more complicated forms of life were invented along the way. One was the cell with a nucleus, which serves as an inner motte to keep and protect the DNA from invaders. Another was the rise of the multiple-cell form, a story easy enough to tell by imagining a division of a cell into two, which then stayed with each other, as embryonic cells do. The third kind is recognized as a type of invasion. One kind of cell entered into another of a different kind, whether by invitation or not, there to take up residence in a symbiotic relationship. The photosynthetic chloroplast and the animal mitochondria share this story, as the invaders that settled in. All higher forms of life—including us—are composites, chimeras, or mosaics, of all three of these processes. The microscopic anaerobic armies had already occupied all of the contested territory, the waters of the world. They had that advantage. But the younger aerobic organisms had a terrific weapon in the oxygen they gave off. Some of that went into the air and slowly oxidised the rocks on the land. It burned down the iron in the seawater too, oxidizing it. The rusted iron fell to the bottom of the sea, there to become our iron ore deposits. This was a long slow process until finally a tipping point was reached perhaps 850 million years ago, when the oxygen level rose to something like what it is today. The old anaerobic forms retreated to a few tiny strongholds and green, oxygenic photosynthesis became the way of life from then on. In this long global battle, Life had remodeled the air and the water of an entire planet, but there was an accumulating cost, a debit on account, to be paid for dearly come the future. The Cambrian Explosion took place in two major phases. After a pre-Cambrian prelude, all kinds of new animals came into being to spread over the floor of the shallow sea, growing out of it, crawling across it, and burrowing into the sediment. Most of these models were entirely new—new body plans, new features like eyes and legs, new arrangements of parts. Then, after a long delay, more new kinds of life were invented that could float and swim, ascending into the waters above like the second stage of a rocket. The trilobites are the most famous of these Cambrian critters. Darwin called their sudden appearance with no ancestors "undoubtedly of the gravest nature" for the fitness and survival of his theory. Since his time all sorts of other exotic Cambrian critters, some with fundamental design ideas, have been discovered: none of them have known ancestors either. Most of these fundamental types have disappeared without further trace, never to reappear, a lost mystery of not-convergent evolution. We’ve seen two of the several kinds of creation of new life forms. For Invention of the First Kind, the new organisms appear in the fossil record as if from out of nowhere. Science may be able to explain how that works and reproduce it in the lab someday; today is not that day. In Invention of the Second Kind, two existing parent organisms create a child organism, like in the story about the chloroplasts. This second process is recognized in many ways in addition to sexual reproduction—hybridization, horizontal gene transfer, symbiosis, metamorphosis, mitochondria, and so on. Genetic engineering is an artificial form of the second kind. Neither of these two processes are Darwinian—there is no identifiable common ancestor; the new organism arises immediately. The creation of a new lifeform by the joining together of two older forms in one step is Darwin’s Tree of Life turned exactly upside down. It is the opposite of descent by gradual modification. In the far distant future, a page or two from now, we will encounter a third kind of invention, almost as mysterious as the first, as if from ideas in the air. The records and the stories are obscure here as to how and when the next epic expansion happened. In one story, an algae teamed up with a fungus, got up out of the water and called itself lichen, a land plant. These and other kinds of composite plant-things first stormed the beaches, then pushed upward and forward into the interior, breathing in carbon dioxide, exhaling oxygen. These original land plants were only a few centimeters tall at best, spreading out across the surface of the continents. Then new kinds of plants rose above the old ones as little stems. The stems didn’t have much area to gather sunlight and CO2, so a leaf came along. The stems with their leaves could now make the ascent into the space above as before, calling themselves ferns and trees, creating whole forests. The forests spread out to cover all of the continents, even Antarctica. There were new kinds of animals that could eat these new kinds of plants. The first microscopic lifeforms left us their messages in ancient rock like mudstones, shales, and limestones, written in letters so tiny they cannot be seen by the unaided eye. Later on many fossils became large enough to see, then large enough to require trucks to haul their bones to the museum. The largest fossils of them all are those stones they left behind, not too tiny to see but too big to see. Some of these fossils are limestone reefs so gigantic they’ve become member states in the UN, like Tuvalu and Bermuda. Other marine fossils were given names like the Cliffs of Dover, or the Alps. The forests that once covered the continents have new names too, like Powder River Basin and Coal Measures Group. These are the fossils that tell us just how massive life use to be. By comparison, our world is a battered remnant of what once was. In the warm and glorious salad days of the Summer of Life the Earth was alive all across the continents and from pole to pole. In a lighter gravity, giant dinosaurs arrived and giant dinosaurs departed. Some were so tall they could eat the giant leaves from the tops of the giant trees. They served even brontosaurus steaks at the drive-in restaurants in those high-flying days. This was a time when scholarly tripwires were invented. Giant flying things flew through the air; giant swimming things swum through the sea. Some days were warmer, others were cooler, some more humid, others more arid, but never was there ice at the poles. Mountains were raised up and mountains worn down; the continents split apart; the oceans opened up, rising onto the land only to fall back to the shelves; volcanoes erupted then were stilled. Flowers were invented towards the end of the dinosaur’s reign, then grass, that uncanny flowering plant. In all the ages before there had been no grass. Around the time the dinosaurs left us, or maybe sometime after, the Earth began to get colder. There was a brief Indian Summer of an Eocene High, followed by the Azolla Event perhaps 50 million years ago. In that event, a floating super-plant either covered the beaches around the Arctic Ocean, or even covered the entire ocean itself, for thousands of years. As the Azolla plants died, they sank to the bottom. The meters-thick, carbon-rich sediments that they left spread across the floor of the Arctic Ocean are thought to be the last of the great carbon deposits on Earth. In the earlier stories, new life spread out across the surface, then ascended into the space above. This pattern was broken in this case. Forests that once spanned continents and reached for the sky were destroyed, burned down and replaced by grasslands and deserts. There had always been forest fires for as long as trees had existed, but this time there was something different. Before, when the trees burned down new trees would grow back up. This time the trees never returned. Sometime in this period, after the dinosaurs but before the Ice Ages, two new kinds of green photosynthesis came around somehow, a story you’ve heard before. Up until a few million years ago, all green, oxygenic plants were of a single kind, called "C3 photosynthesis", the kind that was invented back in the ’Spring of Life’. Two new types are introduced in the ’Autumn of Life’, called "CAM" and "C4" photosynthesis. These are both more adept at conserving water in arid conditions and at vacuuming up aerial CO2. CAM plays a lesser role in the world, found in succulents like pineapple and in desert plants. Naturally enough, along with the new grasslands came the animals that like to eat the grass and the animals that like to eat the animals that like to eat the grass. There are limits to how big an animal can be, whether predator or prey. The most famous of these is the square-cube law, a static relation which limits the size of an animal in a gravitational field, for one important example. But there are dynamic limits as well. The bigger the animal, the more food it needs every day. The more food it needs, the further it has to travel from one food source to the next. The Blue Whale might be the epitome of this process; it has to sweep up huge volumes of water to filter out the krill. But it has an advantage over land animals—at low speeds it can move through the water very efficiently, almost without friction. An herbivore has to walk across a two-dimensional terrain from one plant to the next, which costs a lot of energy. It usually has to eat a bit from many different plants and leave enough so the plant can grow back. The distance it has to travel depends on the size of the plant it is eating, the amount of vegetation per unit area. The size the plant can grow to depends on how fast it can grow between feedings. This adds up to a general rule: for a given rate of plant growth, the bigger the animal gets, the farther it has to walk for food. 10 km per day to get from one plant to the next, then a 1000 kg herbivore would need to move ten times as far, or 100 km per day. It also has to transport ten times as much mass over the extra distance, which takes ten times as much force. With energy as force times distance, the bigger animal would need 100 times as much food energy to do that, not just ten times as much. So, just from this simple physics, the bigger animal has to eat more of the vegetation in a given area. It will exceed the carrying capacity of the land sooner than the smaller animal will. Our field detectives, the ones who specialize in cold cases, have dug up some tantalizing leads. Back in the early days of the oxygen wars, the original atmosphere of the Earth was mostly nitrogen and carbon dioxide. It turns out that the CO2 content was something over ten percent of the total (>100,000 ppm), or at least 250 times as much as today’s 400 ppm. Yet the global temperatures weren’t that much different in the ’Spring of Life’; there were even several extended Ice Ages back then that don’t bear on this story. From that ancient time, through the Summer of Life, and on to the Azolla Event, the atmospheric CO2 concentration had been falling on average, though with plenty of fluctuations. This reduction can’t account for the size of those mountains of limestone and the rest because the amount of carbon in the air, even at 100 percent, is too little. What it does tell us is that the average replacement rate of carbon dioxide, spanning millions of years, has been just a bit lower than the consumption rate. Life had been just a bit too exuberant, too wasteful, starting from the very first carbon-bearing deposits laid down by the original anaerobic plant-things, through the spectacular Summer of Life, and on to the present day. These CO2 sources, which may be mostly volcanoes and seeps, are intermittent and fluctuating. No one actually knows where it all comes from. Perhaps some of the mass extinctions of the distant past (the ’Summer of Life’) might have been caused or exacerbated by CO2 starvation if the replacement rate temporarily dropped below the consumption rate. 1. The vacuum nozzle effect. In order for the global CO2 level to drop, the local CO2 level has to drop a lot more, just as a vacuum cleaner is most powerful right at the nozzle. The air around a growing plant is going to be CO2 starved (and oxygen enriched). This is one of the major keys to the mystery of the Ice Age extinctions. 2. The annual drop, in total tonnage, not ppm, must have been very much larger in the past, in the Summer of Life when the Earth was warmer and luxurious vegetation spanned the planet. Therefore the CO2 concentration must have been much higher back then, otherwise the plants would have starved in late summer. This of course is supported by many other lines of inquiry. 3. A higher rate of photosynthesis would drop today’s CO2 summertime level down further than what we see. The faster the CO2 is dropping out of the system, the faster it has to be replaced somehow. In the Summer of Life that replacement rate had to have been far higher than it is today because the total rate of photosynthesis (land and sea) was far higher. Most of the replacement CO2 comes from volcanoes and fissures on land and under the sea, so these must be much less active today than yesterday. 4. The more tonnage of CO2 in the annual cycle, the more of it that is precipitating out of the system and turning to stone. As the carbon dioxide level falls below the maximum concentration that the plants can use, the rate of growth of the plants will slow down. All of the herbivores will have to expend more energy to go from one now smaller plant to the next. All of the predators have to expend more energy to track down their prey. We’ve identified a rather large and insidious gang of suspects—photosynthetic plants, that is—for the impending mass murders, but we mustn’t be too harsh in our judgment. After all, they were just doing their job and they had families to feed too—not to mention all those lovely and innocent animals they so selflessly supported. With these mitigating circumstances in mind, we’ll need to investigate a little further before passing judgment. We’ll also have to consider the sentencing so as not to inflict undue punishment. Ideally, the punishment should fit the crime, and this was a most uncanny crime. The debate about the causes behind the Quaternary Extinction Event has gone on for a long time without resolution. The pattern of extinctions doesn’t seem to make sense. Things don’t add up. Into this vacuum other theories—stories—about exotic diseases, comets, and black swan events, have been put forth. I made up a new story awhile ago too, about Earth’s gravity increasing just a tiny bit, just enough to make today’s elephant and giraffe the biggest and the tallest possible animals, and the condor or albatross the biggest possible birds. Any of these things—comets, gravity, disease, hunting, black swans, the Ice Age , , and the climate, —may well be a part of the truest story, but none of them can stand on their own. There are too many specific cases that don’t fit: the Ice Age megafauna extinctions were so very selective. Very discriminating. Many of the extinct animals were quite large, the biggest ever of their kind—beavers the size of bears, armadillos as big as cars, giant kangaroos, the largest mammals of all time, the largest marsupials of all time. All the horses and camels in the Americas died out along with giant eagles and terror birds, an even bigger cousin of the huge Komodo dragon, giant turtles, all kinds of different elephant-like animals in Africa, and so many more. Yet not very many plants went extinct, another curiosity, another clue. The sizing problem of a herbivore explains a great deal of the problem but is still too general. Figure 1. Man, possibly with some of the Pleistocene giants The human-hunting idea has what amounts to a military problem. Our ancient parents were as bands of Hobbits surrounded by armies of giant Orcs numbering in the hundreds of millions between their different kinds. A field marshal, reviewing his rag tag tribe of midgets armed with sticks and arrows, would have to weigh those facts against his enemy’s tooth and claw, tusk, armor, size, and troop strength. He would have to retire from the field, discretion being the better part of valor. We saw this dynamic play out in North America in historical times. The Great Plains Indians could not subdue the immense herds of bison that ranged across the prairie lands. Even after the gifts of the horse and the gun, there were still too many buffalo and not enough Indians. They couldn’t build cities because cities need farms, and farms would be plundered by the Million Bison Army. So they had to move their teepees around, always being careful not to pick a place that was too lush, too open, too attractive. They lived on the fringes of Bison Kingdom. As CO2 levels fell, C4 plants became more prevalent. This was when the ruminant grazing animals, such as cattle, were invented, animals with multiple-chamber stomachs and specialized, symbiotic bacteria that can ferment and digest the less-nutritious C4 plants. Bison, for example, graze on C4 plants. After the mass extinctions their predators were mostly gone along with their grazing competitors. The bison were alone on the range, free to take it over in vast numbers. As C4 plants became more prevalent, other animals that were C3 grazers tried to make the switch with varying levels of success. Some of them became hindgut ruminants, a sort of halfway measure. Other ate both kinds of plants. Towards the end, some of these different herbivores were competing with each other by eating from the same dwindling food supply. There were hundreds of species that went extinct, thousands that survived, and each one has a story to tell. I haven’t been able to investigate every case in this first story but so far the confirm rate is well in the majority. There are big C3 browsing animals that survived as well as small grazers that went extinct, so the match is good, but not perfect. The giraffe is a big browser but it has the distinguished advantage of being able to eat from the tops of C3 trees, where no other animal can reach. And so on. During this most recent Ice Age, the average atmospheric CO2 concentration dropped to about 180 ppm, the lowest level in the history of the Earth. As the ice sheets built up, the ocean level dropped, reducing the evaporation surface area that produces rain, so the global climate was also drier as well as colder. The lower CO2 level can’t explain by itself why only certain animals went extinct and others did not. Climate change—the Ice Age, the cold, the drier air, less rainfall explains a great part of it, but it runs into the specificity problem. That should have affected many more plants and animals, not just certain ones. Like climate change, a lower CO2 level is too indiscriminate. But there is another diabolical piece to this puzzle, one I have not found put in its proper place before. At low CO2 levels, C3 plants are competing, with major disadvantages, against C4 plants. C4 plants have other advantages over C3 plants—they are more efficient with water use and better adapted to drier conditions. They have a disadvantage of needing more energy to run their kind of photosynthesis but that can’t help the C3 plant compete if the CO2 level is too low. All year round a C3 plant in a field of C4 grasses is going to be relatively starved of CO2 because of the local "vacuum-cleaner nozzle" effect. That effect becomes more pronounced at lower concentration levels and in still or slowly-moving air near the ground. Imagine a huge expanse of C4 grassland with one C3 plant in the middle of it, with CO2 at 180 ppm. As air slowly moves across the plain, the C4 grass is vacuuming the CO2 out of it, even down to 20 ppm locally. As long as that air isn’t mixing too much with the air overhead, the CO2 concentration will fall with the reach, the distance the air travels. Once it falls from 180 to about 120 ppm locally, C3 plants will stop growing altogether. If an animal eats that plant, the plant will not be able to grow back. At the same time, the animals that eat the C3 plants, which also includes ruminant grazers that can eat both kinds, are preferentially removing the C3 varieties, which cannot grow back as fast as C4 plants. This opens up more growing area for the C4 grasses, shrubs, and what we call weeds for good reason. Figure 2. Generalized growth rates of C3 and C4 plants. Red double arrow is the C3-C4 growth-rate difference during the last Ice Age, at 180 ppm CO2. C3 plants stop growing (i.e. die) at 100 ppm; C4 plants stop at 20 ppm. Green band is the increase due to artificial CO2 emissions, from 280 ppm ca. 1900 to 400 ppm in 2016. 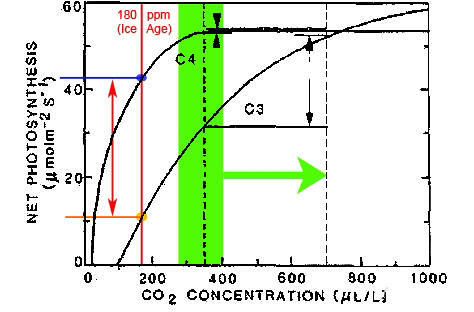 When the CO2 concentration reaches over 800 ppm, C3 plants have the advantage (green arrow). that died were either C3 browsers, C3 grazers, or giant C4 grazers. The mystery of the Ice Age extinctions is mostly solved by this, with caveats and exceptions. We see a potential repeat of the ancient, existential wars which gave us our oxygen atmosphere. At low CO2, C4 plants are the mortal enemies of C3 plants. The terrible CO2-vacuum weapon of C4 photosynthesis would assure their globalist victory and the annihilation of C3 plants and all that depend on them. If the unknown geological carbon sources were to shut off completely, the remaining C4 land plants would then be at war with each other, struggling over the last available atoms of carbon. There is more to C4 photosynthesis than simply a different chemical or metabolic pathway. It has certain architectural features about it, in the way the cells are arranged in rings, or wreaths, and in the layout of the core C4 photosynthetic process itself. With the older C3 process, both CO2 and O2 molecules are presented to the metabolic engines, which only need the CO2. The O2 then has to be sorted out and turned away after it has already gummed up the works, a sloppy process. The great advance of C4 was to solve this problem with the addition of a kind of airlock, a parlour if you will, where the CO2 is first introduced and the O2 is turned away at the door. The carbon is then ushered to the portal of the inner chamber where the fixation process will be done. You may think of it as the same function performed by the butler receiving visitors to the great house. Very selective. Very discriminating. Before the last Ice Age began, a new kind of creature, the one we call Man, came into the world somehow. We don’t know quite how, scientifically, but there he is. He was small and weak compared to the giants that walked the Earth in those days, a bit like the mammals at the feet of the dinosaurs. With the passing of the glorious beasts during the last and worst Ice Age, the way was made clear around the world for Man to come occupy the land. We did not take their world from them; they had to leave it. We learned how to eat the grasses too: not by ruminating, by cooking them with fire. This was probably first tried out of desperation, when the game was gone and the famines began. The C3 and C4 grasses that had replaced the ancient forests became the basis of the Agricultural Revolution and the rise of our uncanny civilizations. Farms and towns were invented even as the last ice sheets were retreating to the North. Then, a few lifetimes ago, our quiet heroes showed us how to rip the coal from the ground and turn it into the power of the Industrial Revolution, paving the way for the human population to increase many times over. In that process, the carbon in the fossil fuel was burned to CO2, enriching Earth’s atmosphere once again. Compared to the permanent devastation that the very next drop in atmospheric CO2 could cause, an all-out nuclear war, or even an asteroid strike like in one of the dinosaur-extinction stories, are mere blips on the radar screen. A severe enough drop in aerial carbon dioxide would mean the extinction of all higher life on land, great and small. Without this CO2 the Earth would revert to conditions worse than they were a billion years ago. Life trapped in the oceans would go on for some time after that, freewheeling off the last remains of available carbon, but no matter how advanced the sea creatures become they would never be able to build a fire or reach for the stars. After the oceanic creatures pass away, no complex life would exist anywhere in the Universe that we know of. In order to continue to exist and to prosper, life on Earth needs one more trick, the one thing that not one of the marvelous inventions of all the eons past had ever been able to accomplish. There has to be some way, somehow, to wrench the locked carbon up out of the earth, to throw it back into the air. Kudos to Forrest for creating and posting this interesting and arresting “Story”. He is my kind of guy in that he looks for and sees the big picture. I find the piece to be quite valuable, even though I would argue with some salient aspects, but not here and not now. 8. Then, after a long delay, more new kinds of life were invented that could float and swim, ascending into the waters above like the second stage of a rocket. 14. There were new kinds of animals that could eat these new kinds of plants. 15. Later on many fossils became large enough to see, then large enough to require trucks to haul their bones to the museum. 16. In a lighter gravity, giant dinosaurs arrived and giant dinosaurs departed. 21. Two new types are introduced in the ’Autumn of Life’, called "CAM"
23. C4 photosynthesis did not arise in a single common ancestor and radiate out in a "Tree of Life", Darwinian fashion anymore than chloroplasts, mitochondria, eyes, or legs did. Instead, it appeared independently and nearly simultaneously in a wide variety of plants, as if the idea were plucked from the air. 25. and the animals that like to eat the animals that like to eat the grass. 27. As CO2 levels fell, C4 plants became more prevalent. This was when the ruminant grazing animals, such as cattle, were invented, animals with multiple-chamber stomachs and specialized, symbiotic bacteria that can ferment and digest the less-nutritious C4 plants. 29. Before the last Ice Age began, a new kind of creature, the one we call Man, came into the world somehow. 30. In order to continue to exist and to prosper, life on Earth needs one more trick, the one thing that not one of the marvelous inventions of all the eons past had ever been able to accomplish. There has to be some way, somehow, to wrench the locked carbon up out of the earth, to throw it back into the air. We are that way. If you concede that these developments were inaugurated and directed by the purpose of a creative, intelligent agency—don’t hear me saying that “god done it”—then these “miracles” suddenly become just stages in a program of using biochemical/genetic manipulation technology. IOW, the earth was terra-formed to general human specifications, probably over a period ridiculously short compared to current thinking. Note: This author does NOT agree with the magnitude of the dating and time spans stated in the above story, but this does not really vitiate its overall sequence and import. Note: One thing that I missed in this article, maybe by conceded design for its getting published, is any reference to the Saturnian Scenario in place of letting the reader think that this all happened in the current solar arrangement.